Hey finally I’ve found my old book digestion speed again ;). 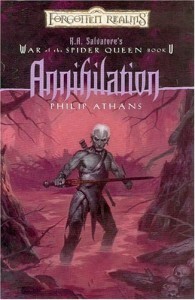 In other words – I’ve quickly used the drive I got from Lisa’s Extinction to dive deeply into Annihilation by Philip Athans. And it worked. It worked well. 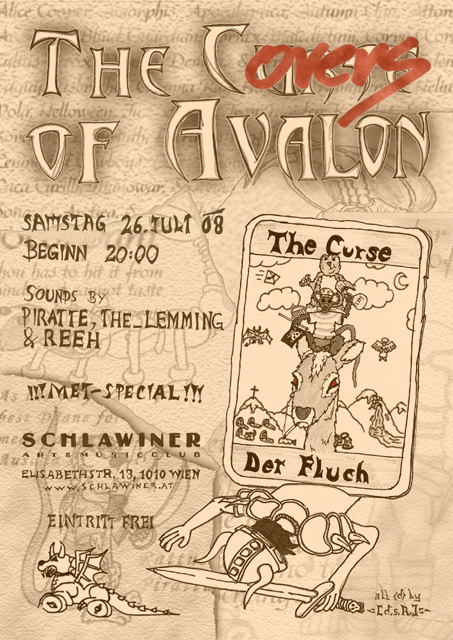 In this book you’ll have the expedition to the Abyss on the edge of destruction and more than that, you’ve a high priestess close to utter desparation – an archmage (of Menzoberranzan) on the verge of destruction – a lichdrow in his finest and darkest moments and an assassin between two sides. 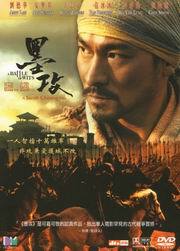 You’ll read that thousands merge into a few, and those eight return. I have to say, it was an impressive read. Due to my work obligations I had a few trips by airplane which certainly sped up my reading in this, but even without these trips, Annihilation was a very thrilling and captivating read. 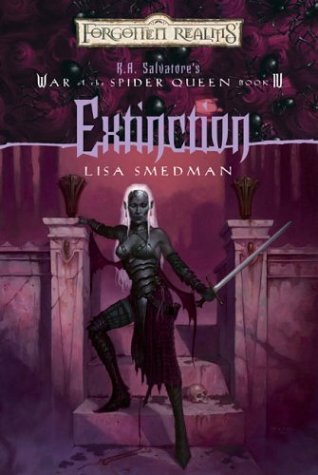 I’m not quite sure if I like Philip Athans’ personal style with the underdark and his approach to the characters as much as I did Lisa’s – but I have to admit it was a continuosly coherent and action filled read coming from someone with a greatÂ imagination of this world. So it finally looks like I will manage to get the War of the Spider Queen read within the next time and can go on with some of the decent looking books from my self-filling shelfÂ :). 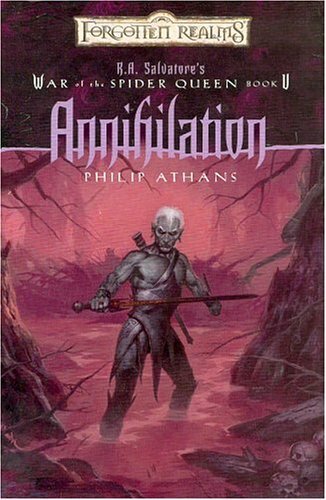 I would rate Annihilation with a decent 8 of 10 points, given I am not too fond of the writing style, but Philip did a great job on killing one of the characters I was certainly enjoying most on the way, and still I think he did extraordinary well in the scenery. My personal favorite is her approach to Gromph, the archwizard of Menzoberranzan, his dealings and troubles. There are incredible nice ideas for challenges in this book – a great, short overview of an aboleth “society” and their powers – an illithid, ElistraeeÂ priestesses, Werewolves -Â I like the changes during the storyline – and the flaws and merits every character seems to possess. It wasn’t the best book I’ve read, but it’s close to Paul S. Kemp’s novels and I am very much looking forward to read Lisa’s others books after I finish with this series. (Which keeps me from reading other books for far too long now).